Our Model 80 catalytic wood stove is ideal for heating most mid-size homes up to 2600 square feet . 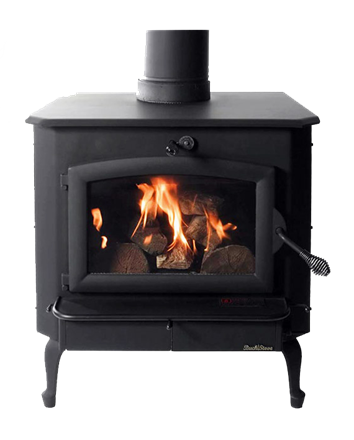 Versatile installation capabilities - we have priced the Model 80 as an insert, but it is also able to be installed as a freestanding stove, with Queen Ann cast legs and 8" Buck Cast stovepipe collar included for an additional $249.95. With a 2.6 cubic foot firebox, the Model 80 rates among the roomiest in its class. The firebox can accept up to 22" firewood (loaded side to side) for an easy overnight burn to keep you and your family warm all night. The "Hot Shot" quick fire-starting feature is built-in to the Buck 80 for re-starting your fire quickly & easily in the morning.